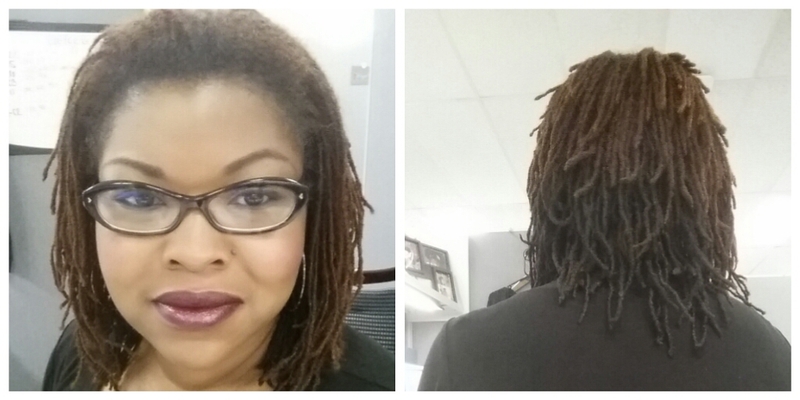 It’s been a month since the last time I had my locs colored professionally. 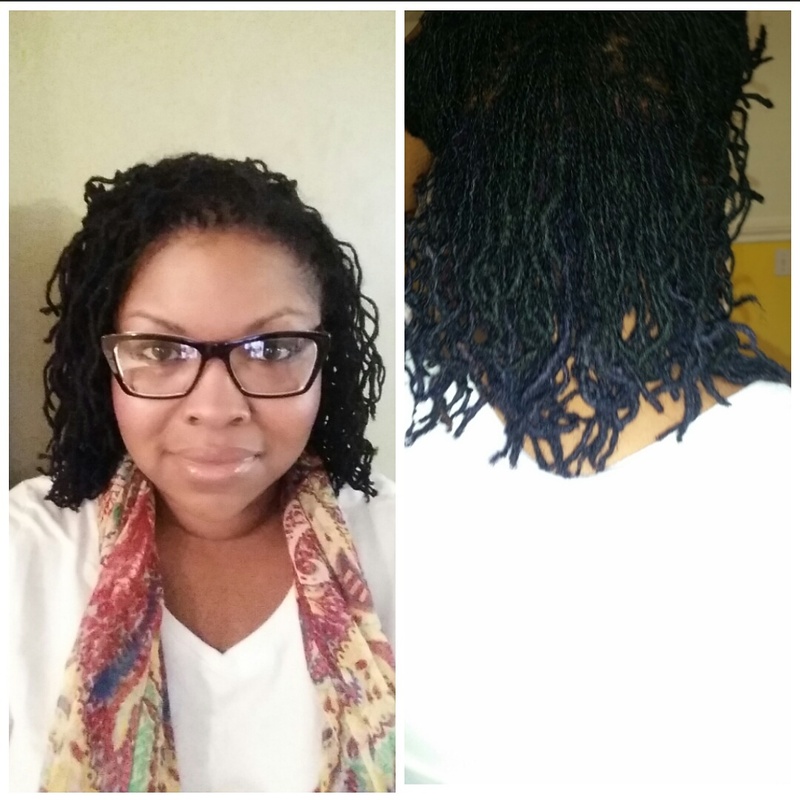 I explained in my The Wizard of Locs post about the process I went through, having my locs colored. The first application was too dark, the second too bright. I’m pleased to say that the third time was a charm, I’m finally happy with the color of my hair. I am not a cosmetologist and even though I’ve worn my hair natural for the past five years, I prefer to have it professionally done. However, I wasn’t willing to spend anymore money having it professionally done in efforts to achieve the color I desired. I was able to refer to two professionals who confirmed that my hair had been lifted enough and that I just need to find the semi or demi – permanent color I was looking for. (I do strongly recommend having a professional do the bleaching [lifting] process to reduce the chances of severely damaging the hair) The light purple color that had been applied was much brighter than I’d desired and by the second wash it had faded horribly. 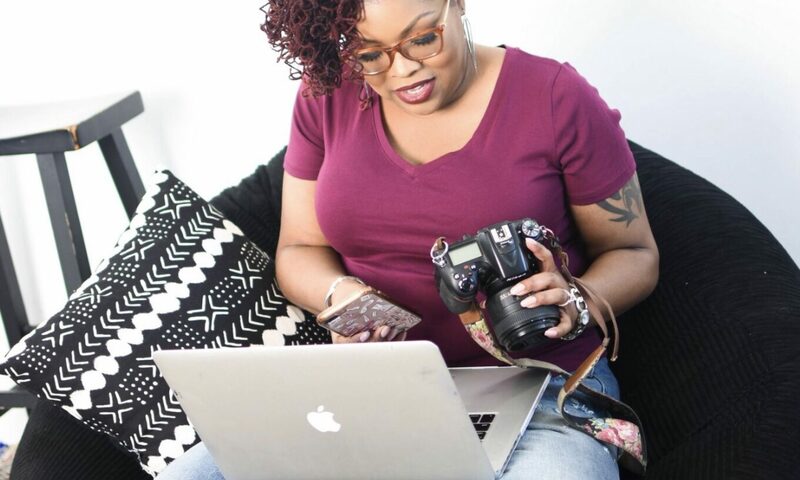 I used Instagram, Pinterest and YouTube to seek out not only the color I wanted, but a brand that was well known for not fading as quickly. 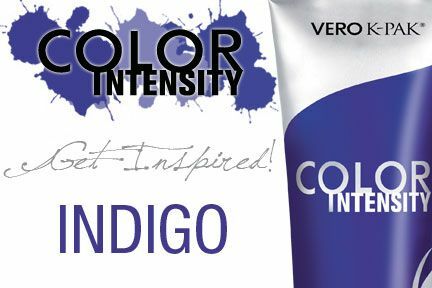 I ordered the color Violet, by Pravana. 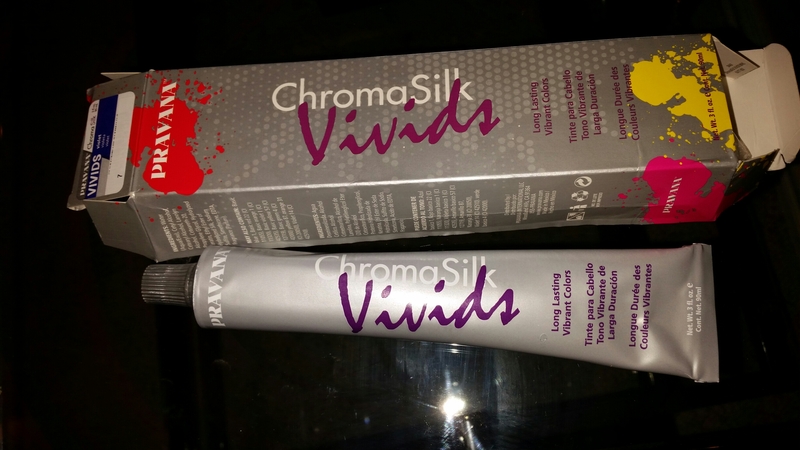 Pravana is a professional brand, but there is a version of their ChromaSilk VIVIDS line on the Internet. I purchased mine from Amazon.com. Eventhough I had spoken with two professionals and had done my research, I stilled struggled with the thought of applying the color myself. After watching a few more YouTube videos, reading a few more reviews/blogs and reading the instructions in the box, I decided to go for it. There was just one issue…the color needed to be applied to the back portion of my hair. I can’t see that area without a mirror behind and in front of me, and the #1 warning I saw on every review for this product was that it would easily stain anything I came in contact with and would be hard to get out. I had to turn to my BFF/BFB for assistance. We were both beyond skeptical of my decision. My husband was puzzled and in shock that I would even consider allowing him near my hair for such a task. The color application didn’t require anything more than saturating the hair with the color, there was no mixing involved, and I was confident that he could handle that. I read the directions to him and got everything in place. He soon realized the task was all that detailed and was up for the challenge. Once he got started my nerves set in. 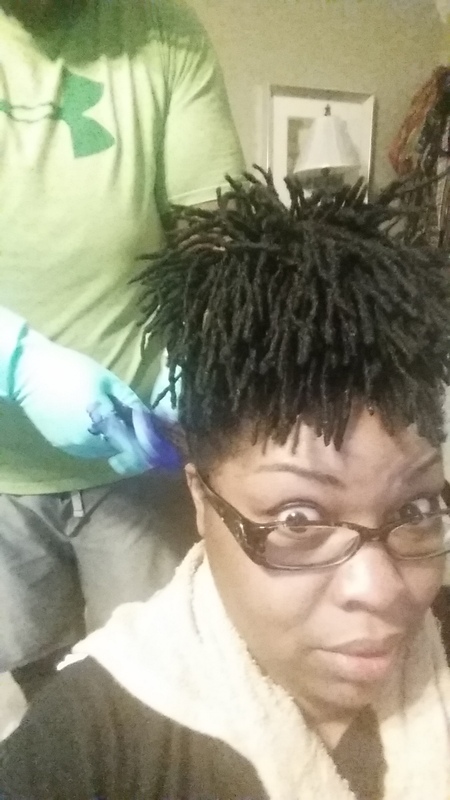 That awkward moment when you realize YOUR HUSBAND IS COLORING YOUR HAIR!! His enthusiasm was adorable. He was more concerned about the outcome than I would have imagined and quickly became delighted with his “skills”. 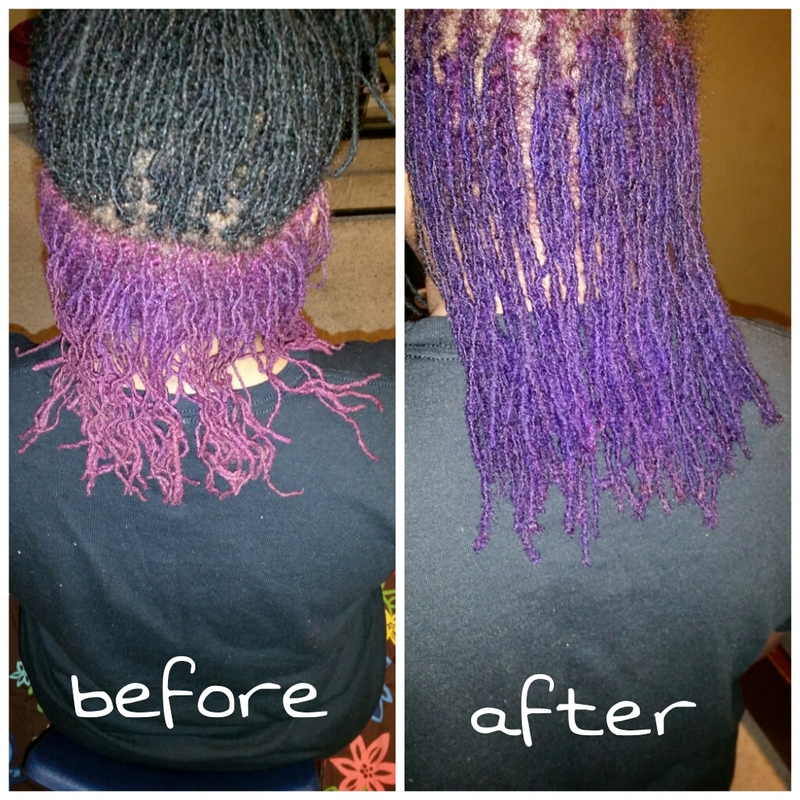 We wanted to be sure that all the locs were saturated with the color and used a little over half the tube. I followed the instructions and allowed the color to process at room temperature for 20 minutes, then washed it out. The reviews were right about staining. There was a lot of product in my hair, it took four washes to finally see semi-white suds and clear water while rinsing,and yes my tub is stained. Despite having to scrub the tub, for what seemed like forever, I think he did a GREAT job! I’m pleased with the outcome so far and I’ll check back after three washes. Fall is here, it’s my most favorite season. One of the first things I do to my hair when fall arrives is darken it. I usually highlight or go with all over color in the summer. 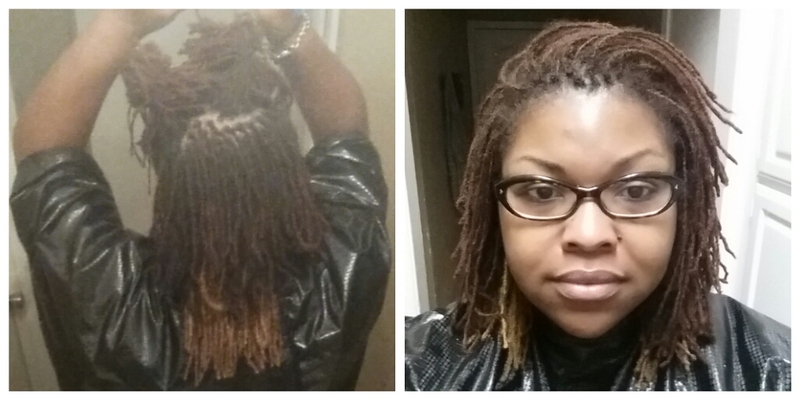 Changing my hair color in the fall is an is an inexpensive way to change my look for the season. I always go with reds, bright tones for the summer and deeper tones for winter. I put much thought into the decision. My stylist was right because time has made some purple tones more acceptable in the workplace. I called her up and let her know that THIS YEAR, WE G’ON DO IT. 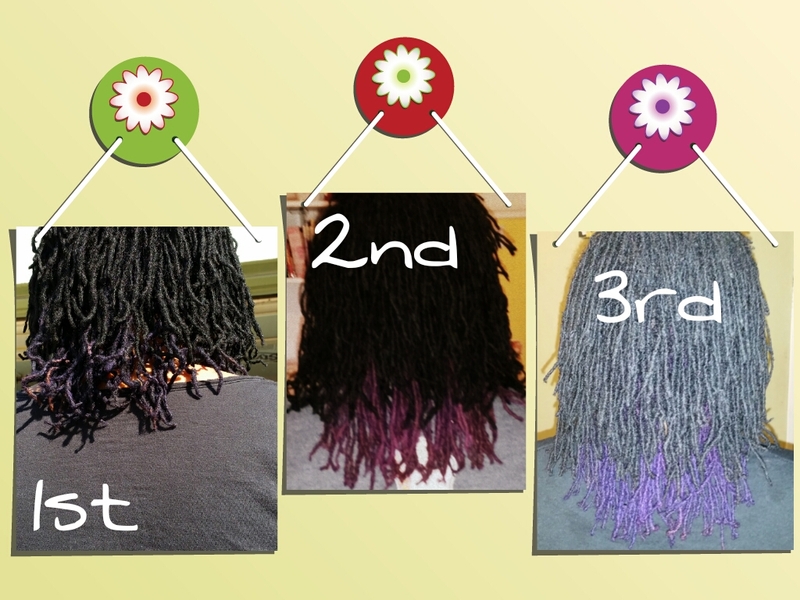 I want PURPLE LOCS FOR FALL! 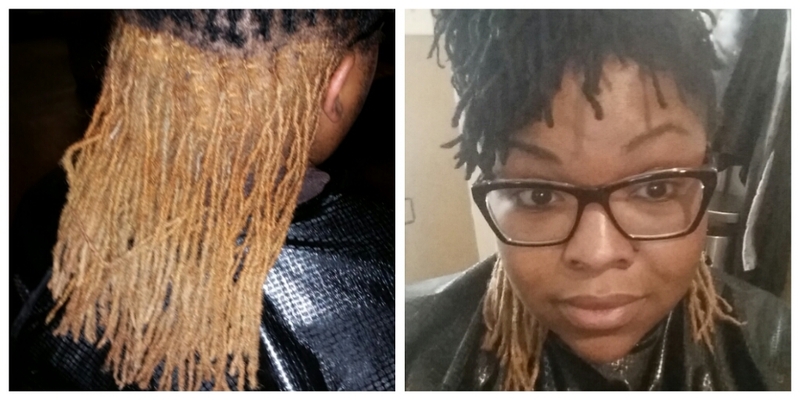 I know my stylist, I knew that she would not be too keen on bleaching my hair, especially this (dry air) time of year (fall/winter). I scoured social media for the perfect shade of royal. 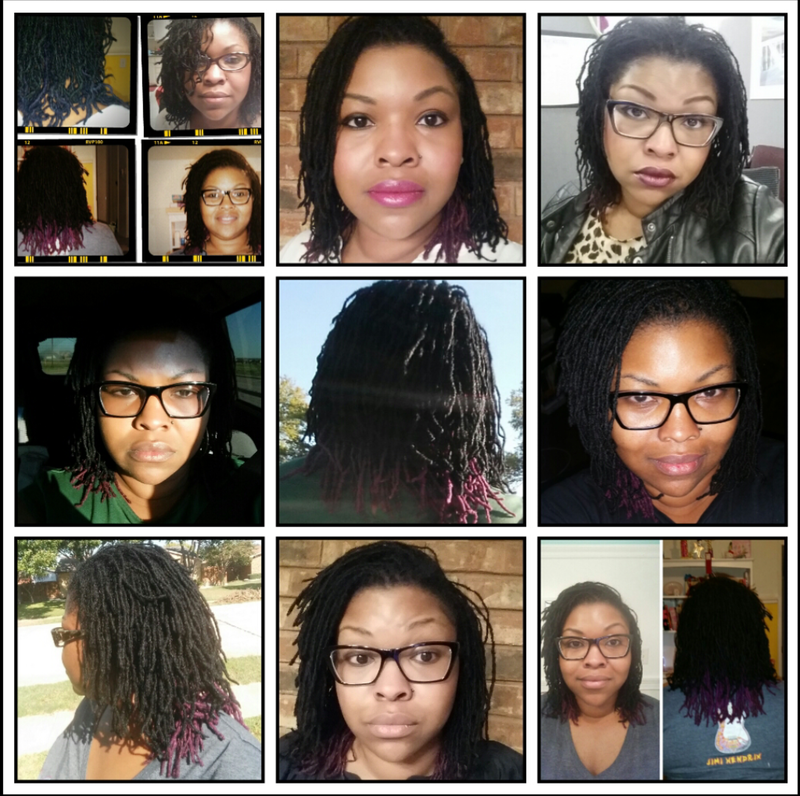 After my color consultation and taking all factors into consideration, including the health of my locs, I settled on black with a splash of purple in the back. (Some of these pictures are poor quality, I apologize about that.) The back portion of my hair was lifted to a light brown color. Then a semi-permanent color, Indigo was applied to that area and black to the rest. I was happy with the black, it was just what I’d hoped it would be. The color was ok, but I expected it to be more visible. However, it was a nice start and good transitional color for work. Two weeks later I had the back lifted again, this time to a gold color. 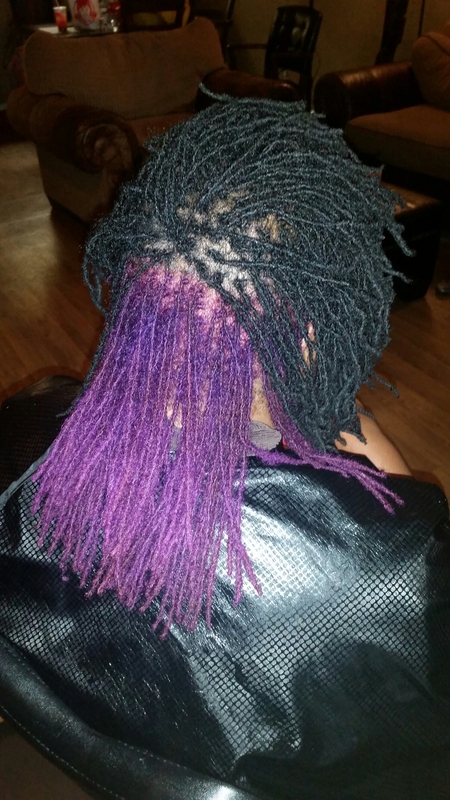 Then the semi-permanent color Light Purple was applied. 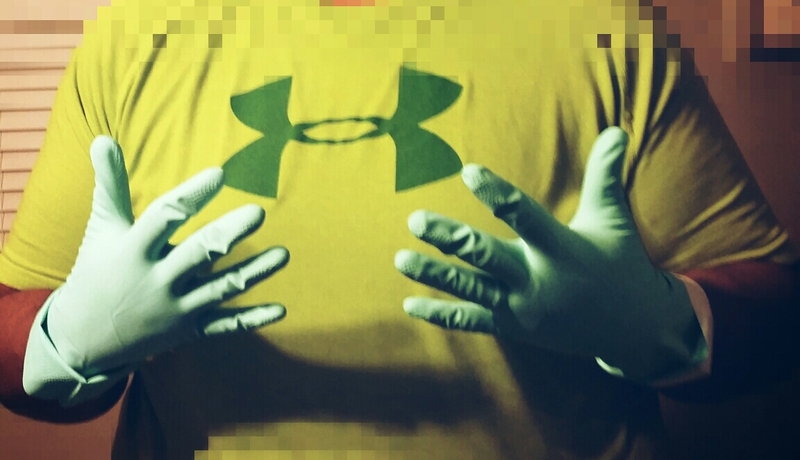 I’m happy that the color is visible. It’s a little more visible than I’d anticipated, but it’s cute. The black overlays so much of the purple that it doesn’t look as bright as it actually is. I get a lot of compliments and I’m really enjoying it so far.